Real working lights and a breakfast counter. Contents: Kitchen and 19 accessories. Batteries Required: 3 x AAA (not included). 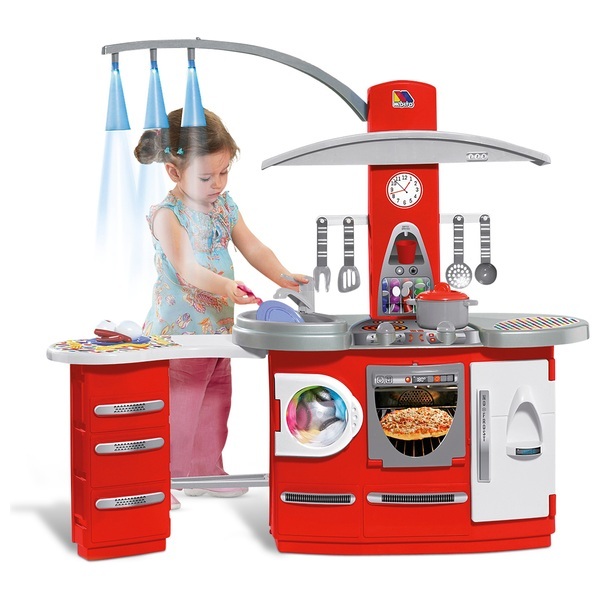 This Molto Deluxe Kitchen with Lights is brightly coloured with fun and realistic features. Molto Deluxe Kitchen with Lights comes totally equipped with two different play areas. One side can be used for cooking and the other side is a breakfast bar used for eating and storing all the accessories. Hours of fun with Molto Deluxe Kitchen with lights which features an extractor fan hood, oven, fridge, double stove cooker and hotplate. Clean up with the sink and washing machine.